eh? - A mummy's inane blabberings..
We entered the lift leading to our apartment from the lobby and there was already a family of 4 comprising of a couple in their 50s, a lady and a young girl aged abt 12. "Any space? ", the li' one asked and they promptly made way for us. As usual, when there are strangers, Aidan would be extremely well-behaved and he stood at the corner of the lift and smiled at them sweetly (if he was alone with us, he'll be jumping up and down like a monkey). "So pretty!!" the older lady exclaimed. "Such beautiful eyes and lashes and a sharp chin!" "Boy or Girl?" queried the younger lady, whom I presumed to be the mother of the teenage girl. Huh?! Boy or Girl? Used to get that a lot when he was a baby but I thought he's too samseng now to be mistaken for a female. Aidan was wearing a polo-tee and cargo pants. I thought there shouldn't be any doubt of his gender. I guess it's probably his hair. Gotta get his locks shorn soon! not only the mother..the older lady too! she also thought he was a girl! Get ur hub to grow long hair? hee hee... Aidan still looks boyish to me! Sometimes people are quite blind lah. I think it's perfectly obvious he's a boy! yeah lor. thought it was a no brainer that he was a boy. even i'd told them he was a boy, they insisted he looked more like a girl..hub and I were like flabberghasted and Nenita kept giggling. I used to be mistaken for a boy from I was about 6 till I was 12 (and then THINGS started happening) and I remember being so pissed all the time! I hated going to the public restrooms... WITHOUT FAIL, women would tell me I'm in the wrong toilet and call me xiaodidi. I blame my mother for cutting my hair with a bowl. hahahaha! thankfully they did eh =) eh, do you have pics of yourself at that age? this i gotta see! aiyoh! he's definitely all boy wat!? Seriously, if you have agency connections (i'm sure you do) can get him into some TV commercials. That child model whom i said resembles Aidan appeared in the Pediasure TV commercial - both my helper and Tenny concurred! It is affirmative that the family is completely BLIND! Hello! Bachewtastamp or what?! He can no way be mistaken for a girl lah! And BTW, as I was reading your post, my dear Herlene just exclaimed this..
"Fwah! 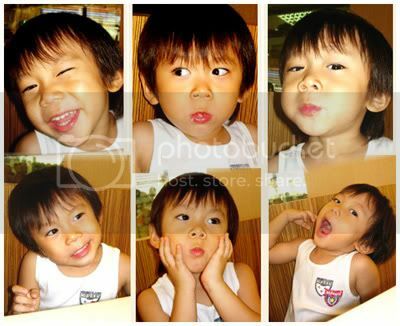 Mommy that Aidan is so handsome hor!" hehehe..dunno why they so blur! how come herlene never thought he was handsome when she met him at anny's place *grin*..she's being nice lah! aiyoh chabor. sick again! u really should go get some rest and dont think of work too much! I thought you only get that when they're still botak?Definitely a handsome boy lah! How strange they are! exactly. at least when they are botak, the only way u can tell is by the colors they wear. but even so, pple still blur. my friend who always dress her baby in pink gets such question all the time! NO CREW CUT TILL ........!! yeah..i like him with long hair but will trim it once in a while when it gets too long..
alamak..shann's hair is quite long now right? blur lah some pple! Haha...it happened a few times to my boy too. Aiyoh, these pple cannot see that our boys are in boy's clothes meh? hanor! but should be able to tell from the features that he's a boy too! and they r both moms so i thought they should know better!